CHRISTIANS ARE CALLED TO LIVE A RIGHTEOUS LIFE. However, there is one particular type of “righteousness” that can easily prevent us from entering the Kingdom of God. In fact, this kind of righteousness had been heavily condemned by our Lord and Savior, Jesus Christ. It is also the reason that Job was punished by God. This deceptive type of righteousness is so potent that it can easily spiritually blind a person and not even know that they have it. I am talking about SELF-RIGHTEOUSNESS. This problem has been a common sin throughout the history of the Church. After all, it is so easy to be self-righteous. It is a human and natural inclination that we all need to overcome. It is so difficult to detect self-righteousness in our lives. In fact, it takes other people and the word of God to point it out for us. That’s why in this blog post, I want to share with you ten of the deadliest signs of self-righteousness. Have you ever been around a person who made you feel uncomfortable, unrighteous, and guilty because you can see how he OBVIOUSLY show his righteousness? This person constantly rubs on your face his righteous acts and in the process, unconsciously PUT PEOPLE DOWN. As a result, you don’t like to make friends with this person because he has this aura of making you feel spiritually inferior. That’s exactly what self-righteousness does. IT REPELS PEOPLE. On the other hand, genuine righteousness DRAWS people toward you. Jesus Christ is the perfect example of a righteous Being. He draws people toward Him and not fend them off. The Pharisees and scribes are the perfect EPITOMAI of self-righteousness. For that reason, Christ ardently reprimanded them. 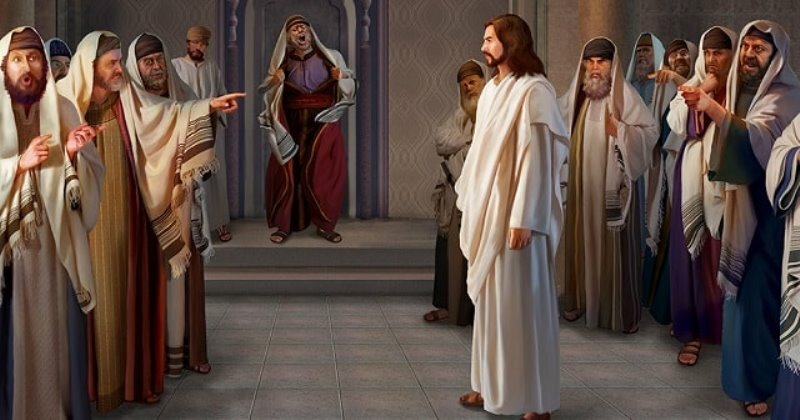 Read Matthew 23, and you will see how many times Christ said, “Woe to you, Scribes and Pharisees.” Christ stated that we must exceed the righteousness of these people if ever we want to enter the Kingdom of God (Matthew 5:20). So what’s wrong with the Pharisees and Scribes? They love to PUBLICLY display their righteousness to people. They were “wearing their righteousness outwardly.” When they fast, they want to appear to people fasting (Matthew 6:16). When they repent, they don’t produce the fruit of repentance (Matthew 3:8). When they give alms, they sound a trumpet (Matthew 6:2). And the list just goes on and on. You get the point. Self-righteousness is more of the outward manifestation rather than an inward conversion of the person. Being self-righteous makes you a person without much compassion. Why? Because you see other people full of sins and faults and you don’t understand why they are that way. You have a hard time looking into yourself and REALIZING THAT YOU ALSO HAVE A LOT OF UNCHECKED PROBLEMS. Instead of being compassionate, self-righteous people are very critical of others. Whenever you are in the presence of a thief, adulterer, extortionist, or somebody who have committed a horrible sin, does it make you feel uncomfortable? A self-righteous person hates sinners instead of just hating their sins. The danger with self-righteousness is it makes you believe that you are in the position of God. You CONDEMN people and pass permanent judgment. You determine who will be part of God’s kingdom and who will not. True righteousness loves the sinner but hates the sin. Among the motivations of a self-righteous person is to gain approval from people. He wants to look righteous, so people hold him in high regards. This is exactly what the Pharisees did. They did their alms in front of many people, disfigured their faces when fasting, loved to sit at the best seats in the synagogues, and enjoyed being called with pompous titles, just to name a few. Sadly, they have their rewards. They have not waited for a far GREATER reward that only God can give them. When we do something good, we do it not to show how righteous we are, but instead, WE DO IT TO SHOW HOW AWESOME THE LIVING GOD IS. We do our good deeds so that people “may see [our] good works and glorify [our] Father in heaven” (Matthew 5:16). Have you ever noticed how hard it is for us to forget the good things we have done to other people? Every time we do something good, we have this little notepad in our brain where we list all our good deeds. Afterward, we add them all up and show ourselves and others how righteous we are! When we do this, we forget that our righteousness is just like FILTHY RUGS (Isaiah 64:6). Our righteousness pales down to nothing when compared to the righteousness of God. In reality, it is not our job to list our good deeds. It is God’s. “For God is not unrighteous to forget [our] work and labor of love, which [we] have shewed toward his name, in that [we] have ministered to the saints, and do minister” (Hebrews 6:10). If we remain self-righteous, time will come that it will make us callous. We hold on to our self-righteousness and it will harden us. And by the time when we need to be corrected, PRIDE sets in, and we become unteachable. This hardness of heart may spring from the belief that you know almost everything, that you already know what the scripture says, and nothing new can impress you anymore. You think that there’s nothing to learn anymore and you won’t let anybody tell you what to do. We have become too vain in our thinking that we won’t allow anyone to point out where we might have got it wrong. True righteous people possess a child-like attitude. That is entirely different to what self-righteous people feel about themselves. Jesus Christ was teachable in spite of His wisdom and divine nature. He did everything and anything His Father told Him to do. For God to work with self-righteous people, they need to be humbled first. However, self-righteousness may persist. Like Job, we may talk back to God and rationalize our thoughts and actions. We may show God how rich, how we have increased in goods, and how we have need of nothing (Revelation 3:17). We may tell God how good we are by following His commandments and that He owes us a pat on the back and praises! However, just like the Laodicean church, we didn’t know that we are actually “wretched, miserable, and poor, and blind, and naked” (same verse). Sometimes we think so highly of ourselves that we felt that God needs us so badly. Actually, the reverse is true: It is US who desperately need God! Righteous people DON’T think about the things they lost for following God. But rather, they concentrate on the things God gave them! Every time a self-righteous is chastened by God, he sulks in self-pity. Instead of seeing trials and challenges in life as a way to develop godly righteousness, they would instead pity and prevent themselves from developing the ENTHUSIASM to fight back. James said that we must “count it all joy when [we] fall into various trials.” For a self-righteous person, he would just endure the trial and not actually rejoice in it. WE NEED TO SEE CORRECTION AS A WAY TO BRING US BACK TO OUR LOVING FATHER. When God gives us a trial, it is NOT because He wants to prevent us from getting into the Kingdom, but to help us develop the righteousness that enables us to be part of His Family. When we are corrected for our self-righteous arrogance, we must have a positive attitude, learn the lesson, and overcome. That’s the only way we can destroy the shackles of self-righteousness that restrict our spiritual growth. Here are the 10 deadly signs of self-righteousness. There’s no doubt; it’s HARD TO SEE THE SELF-RIGHTEOUSNESS IN US. In fact, every time we do something good, the natural response is to have a certain amount of self-righteousness budding in our hearts. However, if we truly see what we truly are without God, then we will realize that our righteousness must be from God. After all, it is CHRIST WHO LIVES IN US, and it is Him who helps us produce the fruit of the Holy Spirit. Instead of building our own righteousness, WE NEED TO BUILD THE RIGHTEOUSNESS OF GOD. This is a profound and significant subject we all need to think about. Self-righteousness is indeed a fatal sin that we all need to overcome, and by being alert to these 10 signs of self-righteousness, I hope we can be more successful in becoming less like us and be more like God!